Developers plan to bring jobs, an anticipated $2 million dollars in revenue a year, as well as a healthier lifestyle and a safe place to play, to the East Austin community. 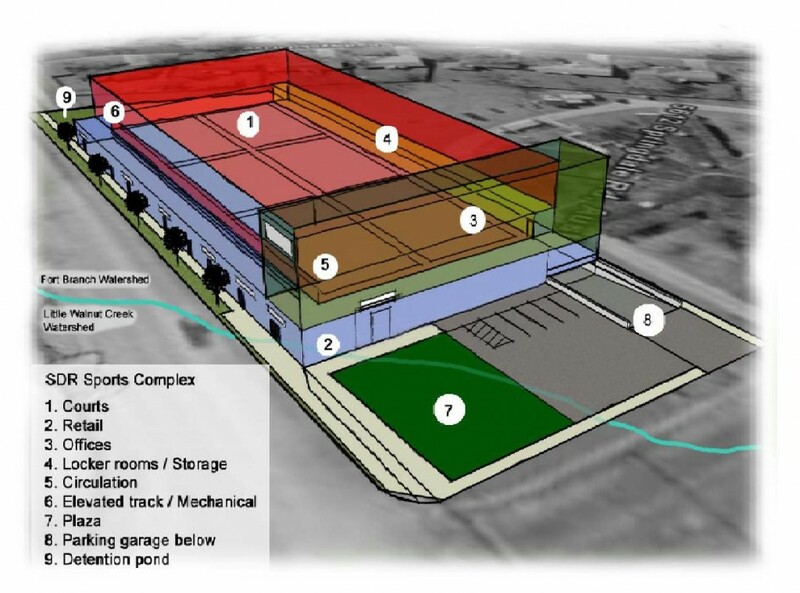 The Central Texas Sports Alliance (CTSA) plans to start building an indoor/outdoor multi-use sports facility on a large plot of land on Springdale Road, between 51st Street and Manor Road, in a few months. The project could cost anywhere from $7.9 to $10.5 million, depending on amenities. Developers have built similar facilities in Richmond, Virginia and Plano, Texas, where a second facility had to be built to accommodate the growing demand of the community. 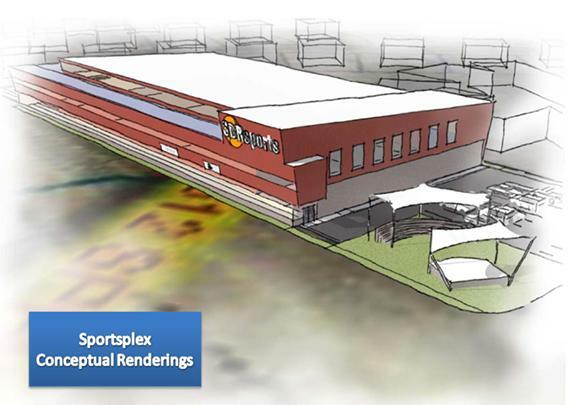 The Central Texas Sportsplex Champion Center will be built around six full-size basketball and nine volleyball courts that can easily convert into indoor football and soccer fields, rock climbing, and an indoor walking track built above it all. At 610 feet, the facility will have a great view of downtown Austin. Also housed in the facility will be retail stores, meeting rooms, business office space, restaurants, and an outdoor pavilion for concerts and events. Preliminary designs for the Sportsplex were made by Fromberg Associates, Ltd., an Austin-based firm specializing in educational and athletic facilities. Developers have taken the initiative to “go green” with the installation of solar panels on the roof of the building and plan to participate in Austin Energy’s solar rebate program. The land for the Sportsplex, which is owned by the project manager, lies in the heart of an economically diverse community. Located on Springdale Road, it is across the street from the future Raul Alvarez Disc Golf course, near the affordable new Senate Hills neighborhood, and less than two miles from the more expensive Mueller complex. According to a CTSA representative, residents in that area have been clamoring for some development in that area. There were no Starbucks east of IH-35 in Austin before the only one so far opened up approximately two years ago in the Mueller development, but that is barely a mile away from the east side of the highway. The facility has already been guaranteed $10 million in New Market Tax Credits (NMTC) from Pacesetters Capital Group out of Richardson, TX. NMTC is a program designed to make investment capital available to businesses in qualifying low-income communities, to create jobs, and spur additional economic development. Sheriff Greg Hamiliton, who has been involved with the project since its inception, says that a facility such as this is “long overdue”. The concept since the beginning of the project has been to team up with the Austin Independent School District, the county, and businesses to provide positive activities for children, such as tutoring and sports, he said. “It is a win-win situation for the city, and especially for at-risk kids,” continued Hamilton. He thinks that “having a safe place where kids can go and intermingle with other kids” is truly needed in the area. The Sportsplex caters to people of all ages, interests, and skills, from after-school programs, camps, and a computer games challenge room for youth, to fitness and health and wellness classes for adults and seniors. Leagues competitions will be offered for boys and girls, adult males and females, and seniors and pick-up play options will be available. Use of the facility will be membership-based, with fees based on individual, family, and organization, but membership is not mandatory. Fitness center membership prices are reasonable, starting at $9/month for students, up to $35/month for a family package. Developers have had talks with the NBA development team, the Austin Toros, and ESPN Radio in regards to considering the Sportsplex as a future home for the organizations. They are currently in discussions with a major food and beverage company regarding exclusive rights for concessions. While Austin is usually referred to as the Live Music Capital, it is slowly becoming recognized in the sports arena as well. Austin is consistently ranked as one of the top healthiest cities in the country; it is home to the number two-ranked BCS team, the University of Texas Longhorns; has a growing interest in hockey thanks to the American Hockey League team, the Texas Stars, moving to the city in 2009; and plays host to the Texas Relays, the second largest track meet in the U.S., every year. This recognition is spreading even more so thanks to the recent announcement that Austin will be the next host city for the Formula One U.S. Grand Prix from 2012-2021.